- Publisher When the ground shakes, and a poor nation's economy is destroyed; when the waters rise, washing away a community's hopes and dreams; when a child suffers neglect and abuse; when violence tears apart nations; where is God? If God is all powerful, and if each one of us is a beloved child of God, then how can God allow tragedy and suffering to infest his creation? In Why? Making Sense of God's Will best-selling author Adam Hamilton brings fresh insight to the age-old question of how to understand the will of God. 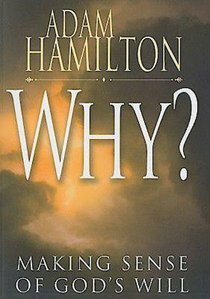 Rejecting simplistic answers and unexamined assumptions, Hamilton addresses how we can comprehend God's plan for the world and ourselves. 1. Why Do the Innocent Suffer? 2. Why Do My Prayers Go Unanswered? 3. Why Can't I See God's Will for My Life? When it comes to the weightiest problems for our faith, like suffering and unanswered prayers and God's will, philosophers don't get the job done for me. But thoughtful pastors do. For me, the one thoughtful pastor who offers wisdom for our deepest questions is Adam Hamilton. This book is a rare gift and the kind of book that needs to be close at hand for all Christians. This book proves theology has to be done by pastors. As someone for whom the 'Christian answers' I grew up with failed to satisfy the troubling questions of my adulthood, I deeply appreciate Adam Hamilton's thoughtful book Why? I recommend this book to anyone who longs to leave behind simplistic answers and discover a God who invites them into a collaborative process of bringing redemption, love and hope to a world in desperate need. Unlike many Christian writers these days, Adam Hamilton does actually make sense of God's will. This is a profoundly satisfying treatment of common misconceptions about God. Everyone who asks 'Why?' when confronted with evil, innocent suffering, unanswered prayers, and failure to perceive God's will should read this book. About "Why? : Making Sense of God's Will"
When the ground shakes, and a poor nation's economy is destroyed; when the waters rise, washing away a community's hopes and dreams; when a child suffers neglect and abuse; when violence tears apart nations; where is God? If God is all powerful, and if each one of us is a beloved child of God, then how can God allow tragedy and suffering to infest his creation?